Create a light crispy pizza crust with the American Metalcraft STONE14 rectangular ceramic pizza baking stone. This ceramic pizza baking stone distributes heat evenly and efficiently. It's perfect for making pizza, cookies, stromboli, and bread. LOVE this stone for baking pizza at home. Unlike some of the reviews, I had no problems with cracking and have used my, now well-seasoned, stone in both gas and electric ovens. I think the key to breaking it into high temperatures without cracking is to heat it very gradually. I heated it to 350 and 400 on two separate occasions before going higher, then when I was ready to get to 450/500 I did so over the course of a couple hours the first time. It yields an awesome, crispy pizza crust! Excellent quality pizza stone! Perfect size to sit at the bottom of our oven. We make pizzas quite often and this stone has produced an even bake every time. I liked this because it did heat evenly and well - it is super heavy - but ultimately I retired it because even with light home use it got so gross I couldn't bear it. I found it difficult to clean in the recommended way. I think this is personal preference more than anything which is why I'm still giving it 4 stars. Thank you for the review! We suggest trying this Tablecraft 4103W 6" x 3" Dough Scraper to scrape and clean excess crumbs off of the pizza stone. If you are looking for a new stone, feel free to reach out to our Customer Solutions team for assistance. It worked fine during lunch making three small pizzas at four hundred seventy five degrees but by dinner time dripped small amount of sauce and it cracked with a loud sound. Two stars because it worked for the first three pizzas but not happy with a cracked pizza stone. Thank you for your review, Romuel! We are sorry this American Metalcraft STONE14 14 inch x 15 inch Rectangular Ceramic Pizza Stone has not worked well for you. A Customer Solutions Representative will contact you soon! Having a square stone (vs. the round) has made it easier to bake loaves of bread. This stone made a great crust on the pizza placed directly onto it as well. This is a nice quality product for the price. I've used it to cook pizza and other products with success, and just leave it in my oven other times to maintain a more even temperature throughout the oven. I can't say it was a good product because it came shattered from shipment but the quality of the stone looks great and I'm sure I would've loved it's performance. I'm a person who take seriously the instructions, I read many bad reviews about this Ceramic Pizza Stone, but I tell my self probably those people doesn't follow the instructions, I was wrong, I cooked 2 pizzas, the first one was no problem but with the second the stone get broken and was a mess in my oven, I will sugest to Webstaursntstore.com to not sale this kind of bad product, it ruined our lunch, it was frustrating. Thank you for your review, Jorge! We are sorry this American Metalcraft STONE14 14 inch x 15 inch Rectangular Ceramic Pizza Stone has not worked well for you. A Customer Solutions Representative will contact you soon! This pizza stone is an ideal way to keep pizza crusts crisp and not soggy. I'd recommend buying multiple to save on the bulk discount. This economical pizza stone does an awesome job baking pizzas, flatbreads, and more. The pizza stone is almost square, but take note that it is actually rectangular and put it in with the wide size parallel to the oven door to help it fit better in a residential oven. Make sure you heat the stone slowly to prevent cracking. We use it all the time. Not just for pizza's but for calzons and more. Very sturdy for our use. Heats up fast, holds the heat and cooks evenly. Great product for use for both your business or home. Perfect size to fit a 12-14 inch size pizza. Heats products evenly throughout. Also, this is great for use with an outdoor grill. Super way to host a summer BBQ! This pizza stone has worked out fantastic for me! I looked around for quite awhile and could not find any store that could beat the price. I am very happy with this product especially for the price being half of what others are. Lightweight but durable - a great value!! We use these to cook our gluten-free pizza crusts and they did an excellent job. I'm so glad we ordered 5 of them! use full in our kitchen. you will perfectly cooke a fresh pizza using this this square stone. it make more yummy pizza. will buy more of this. I bought this for my home. I put it on the rack in the center in my barbecue grill. Now it's a pizza oven. Leave the center burners off and just use the outer burners with the dome cover closed.. Let the stone heat up for at least 30 minutes. Be careful not to burn the bottom of the pie. Simply slide a 14" pizza screen under the pizza if it starts to get too dark. Good size for a standard oven, I find the rectangular shape much more versatile than round. It's also easy to store it in a cabinet on it's side if you don't want to keep it in your oven. I used this is a Conventional Gas stove. I preheated it and backed my pizza and really didn't notice a difference. The other issue these are pains to clean. The size of the ceramic stone makes it a versatile product. We purchased this for baking loaves of bread, but it leaves a nice crisp crust on anything you bake on it! Heats up nicely and retains heat well. Great price. Love these stones! I used this in my home and it compares to the high priced home party stones, with the added benefit of a much lower cost. I really love these baking stones. Work well to cook your pizzas on and the price was great as well. thanks again Webstaurant for the low hassle shopping. This one is a hit or miss, I bought 2 the first one broke even though I slowly heated the oven, the second one has been ok so far. I've been using this pizza stone for a few months now. It is very sturdy and is holding up well. Works perfectly in my convection oven. Fantastic size and design. works well for baking pizza or any other food items in the oven or on the grill. would highly recommend this item to anyone looking for something more user friendly than the traditional round stone. We purchased this for making pizzas after the one we'd purchased from elsewhere shattered the second time we used it when about a tsp of sauce slipped off the pizza when we were putting it in. So far this has worked perfectly and we leave it in the oven just about all the time. I have the 15" round version that I also bought from webstaraunt that I prefer, this stone is better for bread, bagels pretzels but if you want it for pizza I would recommend the round version. Now this is what I am talking about. Makes a pizza so much tastier. Even with store bought pizzas, You kids will be glad you bought it. For the money you just can't beet this stone. Heats evenly and cooks like the top of the line products I've owned in the past. Well worth the cost. As with all stoneware you have to be sure to heat and cool slowly or they will crack and break. Needed a larger sized pizza stone that was not round. The 14 x 15" stone by American Metalcraft works great and was very affordable for the quality. Fits perfectly into my apartment-sized stove. Because it needs to heat up with oven, I just leave it on the bottom shelf at all times. Be aware, if you put a baking sheet directly onto it in the oven, it can cause quicker browning on the bottoms of cookies, granola bars, etc. We received the American Metalcraft STONE14 baking stone yesterday, only to find that it had been packaged and shipped poorly and instead arrived in about a dozen individual pieces. The stone itself was part of a larger order, so I would of hoped that the Webstaurant Store would have packaged this a little more securely based upon the item itself. Not satisfied, but hoping that the Webstaurant Store can correct this issue. Thank you for your review! We're sorry to hear your stone was damaged during shipping. Your account has been credited for the broken pizza stone. I looked all over for a decent pizza stone at a relatively good price. When I saw this one, I had to have it. This is a fantastic stone for the price. The thing about pizza stones is that no matter if you spend $100, or $10, the chances of them breaking are the same. So why not stock up on these stones, and if something happens, you will always have an extra. My main hobby is cooking, and for the home chef, webstaurantstore,com has become by "go-to" for things I find I need to make my life in the kitchen a little easier. They work fine for a while, but both of mine broke for no obvious reason, even though they were slowly heated and cooled. It gets three stars considering its reasonable price, but if not for that, I'd have to give it two. Dave F.
Thank you for your review! Please feel free to contact a Customer Solutions Representative if you have any questions or concerns about your purchase. Keep in mind that pizza stones are not meant to withstand drastic changes in temperature. Works well. Bought 4, but 1 came broken, but they replaced it with no problems. Great service as usual. I'd buy these again. I'm sure it was damaged in shipping. It's not just for baking pizza's. I use my Rectangular ceramic Stone for baking all my cookies. It distrubite's the heat evenly all around. We do not wash with soap and water, just wipe off. It worked great as a heating stone but it got dirty on the first pizza and it seems to have gotten stained now that can't be cleaned off but if you don't care about that then it works just fine. Great price on a ceramic pizza stone. Great stone for breads and pizzas. I love the square design makes it nice for fitting in any oven. Arrived safe and the heavy design will make for many years of use. Love this and love the price even more. We wanted to start making pizza on our new grill, this is amazing. Nice and big to hold a generous size pizza. I liked this pizza stone a lot when I first used it. Unfortunately, after only two or three uses it, it broke in half when I was heating it in the oven. Thanks for your review! Make sure the stone has plenty of time to dry before use. Never store the stone in a cold area. Moisture or an extreme temperature change may cause the stone to crack. For the price I was highly impressed by the quality of this pizza stone, it heats quickly and evenly. The stone is great for 12 or 13 inch pizzas however I would purchase I larger stone for pizza more than 14 inches. Great sized baking stone. Allows me to make free form bread loaves and still get a nice crust on the bottom. A little corn meal is all you need to keep dough from sticking. This stone is the right size for a standard sized home oven. It heats quickly, stores easily, and doesn't weigh a ton. I bake bread a couple times per week and always have a good bottom crust. This is a really nice stone, not just for pizza, but for small baguettes, boules,all sorts of breads. I really like the size for home ovens. This pizza stone is great for making pizzas in a standard over! The stone allows for crispier crust and even baking! Great buy and is worth the money!! The Ceramic Pizza stone is great. Used it for the first of many times and it heats up fast and creates a very consistant crisp crust. A real winner. This pizza stone creates a great crispy crust on my pie!! The stone heats up fast and is very easy to clean. I had it for over a year and haven't had any problem with it. I bought this for my nephew and his fiancee' to include in their Pizza Christmas Gift Basket that I made up for them. They report it is doing a great job for them! A good quality pizza stone at a good price. Having been the family pizza maker for the last thirty years when I needed a bigger stone than the old 12"stone I had this fit the bill and then some. Very, very pleased with it. If you like home made pizza, this is a must have. The crust comes out nice and crispy. It also works well to heat up frozen pizzas whose is not so good on its own. 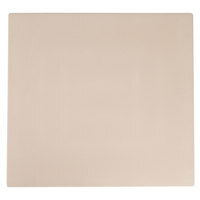 This is a great rectangular ceramic pizza stone!! Great for homemade pizzas or even store bought frozen ones!!! Perfect crust each time!! Good for bread as well!! Easy to clean! This pizza stone is great. This has enough space to cook a large pizza or even dinner rolls. Long baguettes can be tough but making them a few inches shorter will fix that problem. This pizza stone is the perfect size for my oven, which is on the small side. Great for fresh made pizza and calzone with a crispy crust. I got this for baking bread, and it works great. It distributes the heat so evenly that the crust on my breads turn out perfectly! I've owned a nice, thick, Round Pizza Stone for years, and won't cook a Pizza without one. A proper Stone heats the Pizza evenly, gives a nice firm crust (not soggy), and never, ever sticks. I've been looking for a long time for a Square version of my old stone, and finally found one at The Webstaurant Store. Why a Square Stone ? For one thing, they're more versatile. A Square Stone works well with Pizza of any shape; Round Stones don't do well with Square Pizzas at all. I've been planning to do a Square Pizza for years - now I can ! (Though I haven't yet). But I also found an unexpected benefit: sometimes my old Round Stone is tricky to grasp. Recognizing this, it came with a handled carrier made of heavy wire, which I am constantly misplacing. A Square Stone needs no such device; due to its straight sides it's easy to grasp all by itself. I'm thinking my old Round Stone just might be ready for Retirement. This is a great all purpose stone. I have had it for several months and used it dozens of times for artisan bread and homemade pizza. Excellent deal. Thank you! This is good for occasional use, but doesn't seem as ruggedly built as the higher end model. I would recommend the more durable version from the same vendor. This is a wonderful baking stone that gets the job done. It's made baking artisan breads and pizzas a joy. I love that it is a rectangular shape so that I can use it for both pizza and loaves. If you're planning to get a stone, don't forget to get a peel! With a wooden pizza peel, using the stone has been simple and has created stunning results. We've managed to get chewy crust and soft insides using the stone, results that alluded us with pans and sheets. The price is really great as well and I really can't think of any complaints. This is a great sized stone for the home pizzeria. You can slide a 12" pizza onto it without having to worry about spilling it into the oven bottom. With this and the 14" peel, my pizzas blow away anything I can get at the local pizza restaurants. This stone is great for my homemade pizzas. It makes the crust so much crispier than just the oven alone. It is so easy just to wipe it off for cleaning. I haven't had any trouble with the pizza sticking to this stone. I am ready to order another one so I can cook 2 pizzas at a time. The price on this is GREAT! !